Hyacinth Faery is the symbol of joy. She came to life thanks to South Shore illustrator, Kristen Schwartz, who saw her everywhere she looked. In everyone, everything and every moment. 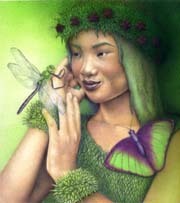 “When I added faeries to my illustrations I developed a project called Faery Medicine. This project, which still exists today, embodies the history and folklore of medicinal plants in an effort to pass on valuable ‘plant wisdom’ in a magical and entertaining way. The main vehicle for presenting this wisdom has been through short stories, or faerytales, and illustrations shown in exhibits. These stories and images have also been available on notecards and as prints. My motto is, “When the wisdom of past generations ceases to exist, so too, shall we”. Because I believe this so strongly, a portion of all my sales as an illustrator goes to the Ethno Medicine Preservation Project which strives to protect cultural information regarding medicinal plants of all kinds. Hyacinth has been used as a flower essence to help induce joy, as an aromatherapy agent to illicit peace, and to relieve grief and depression. It has also been used in herb form. It has been important since the Stone Age. Hyacinth was found carefully tucked around the bones of a Stone Age man in Iraq along with several other medicinal herbs. 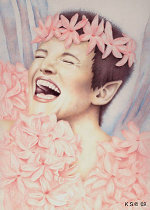 Hyacinth Faery is the symbol of joy and in her faerytale she meets a young boy who refuses to see the joy around him. The faery is perplexed at first, but realizes the problem and helps the boy see what is right in front of him.